Author contributions: Salvadori M and Bertoni E equally contributed to writing the paper, collecting the literature data, revising both the scientific contents and the English wording, and gave the final approval of the version to be published. Hemolytic uremic syndrome (HUS) is a rare disease. In this work the authors review the recent findings on HUS, considering the different etiologic and pathogenetic classifications. New findings in genetics and, in particular, mutations of genes that encode the complement-regulatory proteins have improved our understanding of atypical HUS. Similarly, the complement proteins are clearly involved in all types of thrombotic microangiopathy: typical HUS, atypical HUS and thrombotic thrombocytopenic purpura (TTP). Furthermore, several secondary HUS appear to be related to abnormalities in complement genes in predisposed patients. The authors highlight the therapeutic aspects of this rare disease, examining both “traditional therapy” (including plasma therapy, kidney and kidney-liver transplantation) and “new therapies”. The latter include anti-Shiga-toxin antibodies and anti-C5 monoclonal antibody “eculizumab”. Eculizumab has been recently launched for the treatment of the atypical HUS, but it appears to be effective in the treatment of typical HUS and in TTP. Future therapies are in phases I and II. They include anti-C5 antibodies, which are more purified, less immunogenic and absorbed orally and, anti-C3 antibodies, which are more powerful, but potentially less safe. Additionally, infusions of recombinant complement-regulatory proteins are a potential future therapy. Core tip: Hemolytic uremic syndrome (HUS) is a rare disease, knowledge of which is rapidly increasing. The disease takes several forms, but recent data suggest that the physiopathologic basis in the vast majority of such diseases is complement dysregulation. New therapies are available, including a monoclonal antibody that blocks the C5 cascade. Such therapies lead to a substantial improvement in the outcome, which previously was often poor. HUS often occurs secondary to other diseases. In such cases, diagnosis may be difficult due to the overlapping of two diseases. Complement dysregulation has been found also in secondary HUS. Hemolytic uremic syndrome (HUS) was first described in 1955 by Gasser et al. HUS is a thrombotic microangiopathy that is characterized by three primary symptoms: hemolytic anemia with fragmentocytes, low platelet count and acute renal failure. HUS is a heterogeneous group of hemolytic disorders and thrombotic microangiopathies that are characterized by prominent endothelial-cell damage. Bacterial toxins, drugs, systemic disorders, complement dysregulation and von Willebrand factor (vWF) cleaving protease deficiency are the principal causes of HUS. Due to the different etiologies, modes of pathogenesis and clinical presentations, several different classifications of HUS have been made. Recently the European Study Group for HUS and related syndromes recommended the classification presented in Table 1. 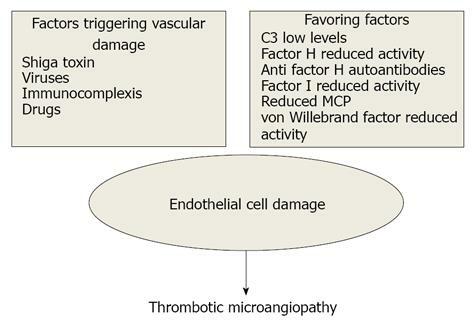 This classification will be used in this paper, although recent data and advances suggest that complement hyper-activation commonly leads to endothelial damage in typical and atypical HUS. Table 1 Classification of Hemolytic uremic syndrome, thrombotic thrombocytopenic purpura and related disorders. HIV: human immunodeficiency virus; HELLP: Hemolysis elevated liver enzymes low platelets; HUS: Hemolytic uremic syndrome. HUS is classified into three primary types: (1) HUS due to infections, often associated with diarrhea (D+HUS), with the rare exception of HUS due to a severe disseminated infection caused by Streptococcus; (2) HUS related to complement abnormalities or related to factor-ADAMTS13 deficit, such HUS is also known as “atypical HUS” and is not diarrhea associated (D-HUS); and (3) HUS of unknown etiology that usually occurs in the course of systemic diseases or physiopathologic conditions such as pregnancy, after transplantation or after drug assumption. Overlapping HUSs occur when two or more of the above-mentioned conditions coexist in the same patient. Infectious HUS, diarrhea associated. Frequently, this form follows an enteric disease caused by Shiga toxin-producing Escherichia coli (E. coli) or Shigella dysenteriae. Shiga toxin-related HUS is the most common cause of acute renal failure in childhood and constitutes 90% of all HUS cases in this population. Gasser et al was the first to characterize HUS describing 5 patients who died with hemolytic anemia, acute renal failure and low platelet counts. Thirty years later Karmali et al found the cause of the disease; all patients with HUS D+ had an E. coli strain in their feces that produced a toxin that caused irreversible damage to Vero cells in vitro. Later, this toxin was found to be similar to the Shiga toxin produced by type I Shigella dysenteriae. Infections caused by Shiga toxin-producing E. coli serotype O157:H7 are the most common cause of HUS in North America, west Europe, Japan, South America, Africa and Australia[7,8]. HUS D+ is more often sporadic, but large outbreaks have been reported. Cattle and sheep are the main reservoirs, and the major transmission route is believed to be food contaminated with animal feces[9-18]. Contaminated water has also been recognized as a source, and direct human-to-human and animal-to-human transmission have been reported. E. coli O104:H4 recently caused a large outbreak in 4000 HUS D+ patients, with 50 deaths in Germany and 15 other countries. The incidence rate of HUS D+ differs according to countries and climate and is higher in colder countries. For example, the incidence rate in Scotland (3.4 × 105 children under age 5) is higher than the overall incidence rate in Great Britain (1.54 × 105 children under age 5). England and France have similar incidence rates, both of which are higher than that in Italy. The HUS D+ incidence rate is highest in children aged one-to-five years in Europe and North America, while, the incidence rate in Argentina is higher in younger children (6 mo to four years). E. coli O157:H7 is the most commonly involved serotype; recently, other serotypes have also been described. Gerber et al in a prospective study described 394 pediatric patients with HUS. They found that 43% of these children had an E. coli strain other than O157:H7 in their stool: O26:H11/H- (15%), O157:H- (10%), O145: 28/H- (9%), O103/H2/H- (3%) and O111/H8/H (3%). E. coli is the most commonly involved species, Shigella Dysenteriae typeI and Citrobacter freundii have less frequently observed. After an E. coli infection with production of Shiga-toxin, several factors influence the progression of the disease to HUS. (1) Bacterial strain. For serotype O157/H7, the progression is approximately 15%; (2) Age: In children younger than 5 years, the rate of progression is 12.9%, while it is 6.8% in children between 5 and 10-year-old and 8% in children over 10 years; (3) Antibiotic therapy. Antibiotic therapy for E. coli O157/H7 infection may increase the risk of HUS , though a recent meta-analysis does not confirm this association; and (4) Environmental and genetic factors. Such factors are not yet fully understood, but several authors have suggested that factor-H abnormalities could influence the disease evolution in HUS D+. Shiga toxin is produced by E. coli in the gut and is then absorbed. Shiga toxin consists of two subunits: A and B. Subunit A, approximately 32 kDa, is cleaved by proteolysis into two peptides: A1 (28 kDa) and A2 (4 kDa). In target organs (e.g., kidney, brain and gut), subunit B recognizes and binds to glycolipid receptors on the cell surface. In humans this receptor is Gb3 (globotriosilceramyde) and is highly expressed on kidney tubular cells, and brain and gut endothelial cells. Moreover, in the kidney cytotoxicity is further amplified by tumor necrosis factor-α (TNF-α)[32,33]. After binding to cell surfaces, Shiga toxin is endocytosed and retrograde-transported to the Golgi apparatus and the endoplasmic reticulum; it is then translocated to the cytosol where it inactivates ribosomes and causes cell death. The pathogenetic mechanisms are shown in Figure 1. Figure 1 Pathogenetic mechanisms of thrombotic microangiopathy. MCP: Membrane cofactor protein. After 3-8 d of incubation, the first symptom is watery diarrhea, followed by bloody diarrhea and abdominal cramps. Nausea and vomiting are also present. Fever is less commonly observed. The most important factors associated with HUS evolution are the use of anti-motility agents, antibiotics, bloody diarrhea, leukocytosis, young age and female gender. The risk of developing HUS after bloody diarrhea due to E. coli is approximately 15%. Recovery is often spontaneous, but 26% of patients develop renal failure, with 3%-5% of deaths[36,37]. Hematological and renal symptoms, including hemolytic anemia, low platelet counts, fragmentocytes, increased lactate dehydrogenase (LDH) and very low aptoglobin levels and various degrees of renal failure may all be present. Other symptoms may arise due to the involvement of other organs such as the brain, pancreas and myocardium[38-40]. Malignant hypertension, when present, is associated with kidney failure and central nervous system involvement. The main clinical and pathogenetic steps of D+HUS are reported in Table 2. Table 2 Development of Shiga-toxin-associated hemolytic uremic syndrome. Streptococcus pneumoniae may cause a rare and severe infectious form of HUS, without diarrhea (SPA-HUS). Cellular injury is thought to be related to exposure of the normally hidden Thomsen Friedenreich T-antigen. Streptococcus Pneumoniae produces a circulating neuraminidase that removes N-acetylneuraminic acid from cell surfaces. As a consequence, the normally circulating T-antigen antibodies react with the newly exposed T-antigen on red blood cells, platelets and endothelial cells, thus causing hemolytic anemia, thrombocytopenia and micro vascular injury. This streptococcal infection is generally severe, disseminated, associated with septicemia, meningitis and pneumonia complicated by empyema. A Canadian study compared children with D+HUS to children with SPA-HUS. The latter were younger; more often had severe renal or hematological diseases, and more often required dialysis. SPA-HUS mortality is high (30%-50%) and patients who recover commonly experience renal failure due to cortical necrosis. 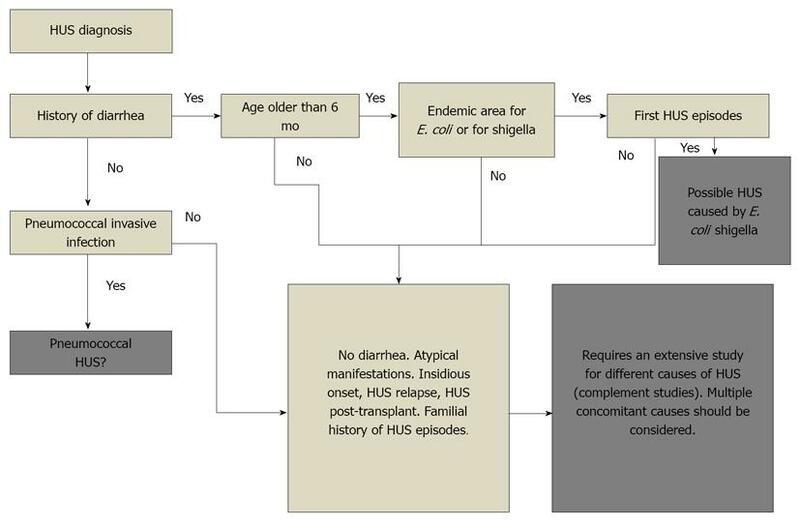 Figure 2 represents a diagnostic algorithm to distinguish among the different forms of HUS. In subjects previously with diarrhea and who are older than 6 mo, the diagnosis of HUS syndrome due to Shiga toxin should be strongly considered, especially if the episode occurs in an endemic area and is not associated with pneumococcal infection. When HUS episode co-occurs with invasive pneumococcal infection, HUS due to pneumococcus should be suspected, even in presence of diarrhea. Figure 2 Diagnostic algorithm to distinguish among different Hemolytic uremic syndrome. HUS: Hemolytic uremic syndrome; E. coli: Escherichia coli. As mentioned above, overlapping HUSs are commonly observed, and any HUS may lack of some typical clinical symptoms. For example, Shiga-toxin related HUSs may occur without diarrhea, and HUSs related to complement abnormalities are commonly observed in the presence of diarrhea. Differential diagnosis may be difficult. In patients with HUS D+ with insidious onset, tendency to relapse and a familiar presentation, all complement abnormalities should be tested for, with particular attention to overlap syndrome. All patients with enterohemorrhagic diarrhea, especially in endemic or epidemic areas for E. coli should be admitted in specialized units. Epidemiological and familial histories should be taken. Stools should be collected promptly and tested specifically for E. coli O157:H7 with culture, Polymerase Chain Reaction (PCR), serology and anti-O157-antibody titer in serum. PCR and testing for anti-LPS antibodies of prevalent serotypes should be conducted. All patients with relapsing diarrhea associated HUS, with the presence of a family history of the syndrome in their family or with insidious onset should be screened for complement proteins and ADAMTS13 protease. When Pneumococcus infection is suspected, a bacterial culture of sterile body fluids should be conducted. According several physicians “typical HUS” is the syndrome above described while all other forms should be called “atypical HUS” (aHUS). As aforementioned in this paper we follow the classification proposed by the European Study Group for HUS and related syndromes. aHUS is more properly linked to complement abnormalities, although several authors discuss it alongside thrombotic thrombocytopenic purpura (TTP). aHUS and TTP share a common pathologic lesion (thrombotic microangiopathy) but have different clinical manifestations. In aHUS the lesions and clinical symptoms are primarily localized in the kidney, whereas the pathologic changes of TTP are more extensively distributed, most likely reflecting the systemic nature of the underlying defect. Clinically, TTP occurs more often with central-nervous-system symptoms, but renal insufficiency has also been reported. aHUS is less common than typical HUS and is characterized by a worse outcome. The disease may have a familial or a sporadic pattern and, may arise due to genetic abnormalities or be acquired. The incidence of aHUS in The United States of America is approximately two per million. In Europe, five national and continental registries report more than 1000 patients with complement abnormalities with an incidence of approximately 1.5-1.8 per million inhabitants[46,47]. Overall, aHUS accounts for 5% of all HUS cases. Atypical HUS may develop in patients of any age, though 70% of pediatric diseases have an onset before two years and 25% have an onset before the age of 6 mo. HUS occurring before 6 mo of age is suggestive of aHUS because less than 5% of D+HUS cases occur before the age of 6 mo. An infection, usually of the respiratory tract, or an episode of diarrhea, triggers the onset of aHUS in 50% of adult forms and 80% of pediatric forms. This pattern highlights the difficulty in distinguishing HUS D+ from HUS D-. In addition, as mentioned above, HUS onset after an episode of diarrhea does not rule out atypical HUS. Additionally, several physiopathologic conditions, such as pregnancy may trigger atypical HUS; 20% of such diseases develop during pregnancy and 80% develop after delivery [50,51]. The clear link between atypical HUS and the complement pathway is well recognized. In the last ten years several mutations in genes encoding complement proteins have been identified in patients presenting with atypical HUS. Atypical HUS is an ultra-rare kidney disease and manifests as a microangiopathy disease with mechanic anemia, thrombocytopenia and acute renal failure. Mutations have been identified in factor H, MCP, factor I and thrombomodulin (THBD). These proteins act as regulating factors of the C3 convertase. Additional mutations have been identified in C3 and factor B. Anti-factor H antibodies have been identified in patients with atypical HUS, particularly in children. Anti-factor I antibodies have also recently been identified. Overall, up to 100000 individuals from cohorts in Europe and the United States have been screened for genetic abnormalities. The complement cascade may be activated by three pathways: the classical, lectin and alternative pathways. The alternative pathway is constitutively active in plasma and leads to a minor attack on all structures in contact with the plasma and other body fluids. Under normal conditions this attack is rapidly down-regulated and there is no damage to cells. The alternative pathway must be strictly regulated to attack only foreign cells by a set of regulatory proteins in plasma and on the host cell membranes. The alternative pathway (Figure 3) is continuously activated by the spontaneous hydrolysis of C3, the so-called tick-over. C3 activation generates the anaphylatoxin C3a and the fragment C3b, which binds to factor B, which in turn is cleaved by factor D to Bb. Consequently the C3 convertase C3bBb is formed. This complex generates more C3b through an amplification loop. C3Bb is relatively labile and undergoes spontaneous decay through the dissociation of Bb. Properdin, synthesized by monocytes and T lymphocytes, binds to and stabilizes C3bBb, thus preventing its decay. As the process continues more C3b is formed and deposited on the cell surface. Thus (C3b)2 BbP is formed and acts as the C5 convertase that cleaves C5. C5b activates the terminal complement pathway by associating with C6, C7, and C8 to form macromolecular complexes called C5b-8, which can bind to cell membranes. C9 binds to this complex, forming C5b-9, the membrane-attack complex (MAC). MAC is responsible for (primarily endothelial) cell damage and favors micro thrombosis. Figure 3 Alternative pathway. The alternative pathway is triggered by spontaneous activation of C3. Activation of this pathway leads to MAC formation which results in cell lysis (in red complement regulatory proteins; in black complement activating factors). CFH: Complement factor H; CFI: Complement factor I; DAF: Decay accelerating factor; MAC: Membrane attack complex; MCP: Membrane cofactor protein; THBD: Thrombomodulin. Several different regulatory proteins, that disrupt complement activation process, are present under normal conditions to prevent complement activation on the host cell (Figure 4). Complement Receptor 1 (CR1 or CD35) and decay-accelerating factor (DAF or CD55) compete with factor B in binding with C3b on the cell surface and can remove Bb from a C3bBb complex. Figure 4 Complement regulatory factors. CR1: Complement receptor 1; DAF: Decay-accelerating factor; MCP: Membrane cofactor of proteolysis. The formation of a C3 convertase may also be prevented when a plasma protease called factor I cleaves C3b into its inactive form, iC3b. Factor I requires a C3b-binding protein cofactor such as complement factors H, CR1, membrane cofactor protein (MCP or CD46) or thrombomodulin[54-56]. Additionally, the plasma protease factor H may inhibit the formation of the C3 convertase by competing with factor B for binding to C3b. CFHR5 (Complement Factor-H related protein 5) is able to bind to and act as a cofactor for Factor I, has decay accelerating activity and is able to bind preferentially to C3b on the host cell surface. Factor H is a highly glycosylated protein of 155 kDa. Factor H is composed of 20 repetitive modules of approximately about 60 amino acids, the Short Consensus Repeat (SCR) which forms a flexible structure. The sites of interaction between FH and its different ligands are well known. Two sites are involved in C3b binding (SCR 1-4 and SCR 19-20). The SCR 7, 19-20 bind to the protein molecules on the cell surface. Factor H has different effects on the complement cascade. Factor H blocks C3 convertase and favors its degradation. 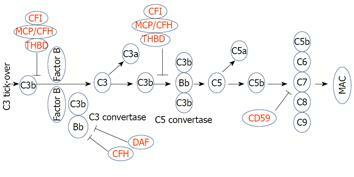 Factor H can act also as a factor I co-factor causing C3b proteolysis and generating the inactivated C3B (iC3b). Moreover, factor H may bind to molecules on the cell surface and act as inhibitors. membrane co-factor protein (MCP/CD46) is located only on the cell surface where it acts as a co-factor for factor I. MCP/CD46 is a transmembrane glycoprotein that is highly expressed on the surfaces of all cells, with the exception of erythrocytes. The extra-membrane portion of the molecule is formed of 4 SCR domains. The SCR 2, 3 and 4 bind to C3b and act as the co-factor for factor I. Factor I is 88-kDa glycoprotein that belongs to the serine protease family. It cleaves the alpha chain of C3b, generating an inactive fragment (iC3b) that is unable to generate C3 convertase. THBD has recently been demonstrated to down-regulate the alternative complement pathway by accelerating the factor I-mediated inactivation of C3b in the presence of co-factors. Typical HUS D+ is well known, but new discoveries are continuatively being made on the role of complement alterations in the pathogenesis of atypical HUS, especially over the last decade. The relationship between low plasma C3 and HUS was first described by Cameron is 1973. The association between HUS and low factor H levels had been described by the 1980s. In 1998, Warwicker described for the first time a mutation in the gene encoding factor H in cases of familial HUS. Since then, more than 100 mutations of factor H have been identified in adults or children with HUS. Several mutations are associated with quantitative deficit of factor H (type 1 mutations); others are associated with factor H normal levels (type 2 mutations). MCP mutations were first described by Richards in 2003. The factor I mutation was first described in 2004. To date, more than ten mutations in factor I have been identified. In 2008, Goicoechea de Jorge described a gain of function mutation encoding a complement activator in factor B, thus creating a “super factor B”. The association between atypical HUS and low serum levels of factor H was described 30 years ago. To date, more than 70 genetic abnormalities have been identified throughout the gene. The mutations are of all types: non-sense, missense, small deletion/insertion. Several patients had homozygous mutations but most patients were heterozygous. Mutations may be classified into two groups. Patients presenting quantitative factor H deficiency have a type I mutation. Such patients have low levels of factor H, which is associated with an uncontrolled activation of the fluid phase, corresponding to a low C3 level in plasma. The second group of patients has type II mutations: they have a functional deficiency of factor H, though the levels of factor H and C3 are often in the normal range[67,68]. Homozygous mutations are associated with very low plasma C3 and factor H. Factor H mutations are the most common in atypical HUS and are found in 20%-30% of these patients. An acquired factor H dysfunction is associated with anti-factor H auto antibodies. IgG anti-factor H binds to factor H and inhibits its binding to C3b and to the cell surface. Low C3 levels are observed in 40%-60% of patients with anti-factor H antibodies, according to the IgG circulating titer. Moore et al reported an association of factor H auto-antibodies with mutations of CFH, CFI, MCP and C3 in 13 patients with aHUS. Anti-factor H antibodies are responsible for 6% of the aHUS cases among the general population, and are more common in children. More than 40 mutations of MCP have been identified, since the first report ten years ago[63,73]. The mutant MCP binds C3b weakly and has no activity as a co-factor. Mutations are most commonly located between the EXON 1 and EXON 6. Homozygous mutations with complete CD46 deficiency and heterozygous mutations associated with a partial deficiency have been identified. The vast majority of patients have low MCP on peripheral leukocytes: this is a useful diagnostic tool. The C3 levels in patients with MCP mutations are usually normal. MCP mutations account for 5%-15% of aHUS cases and are more common in children than in adults. When MCP mutation is associated with low C3 levels, other mutations of complement factors may also be associated. Approximately 40 different factor I mutations have been identified in patients with aHUS. All of the identified mutations were heterozygous[65,75]. Factor I mutations may cause either a defect in protein secretion or a modification of the protein structure, with a consequent reduction in its co-factorial activity. Therefore, the reduced degradation of C3b/C4b is observed either in the fluid phase or on the cell surface. The frequency of factor I mutations in patients with aHUS ranges from 4% to 10%. 30% of patients with factor I mutations also have mutations in other genes encoding complement-regulatory proteins. Recent molecular studies demonstrated four novel mutations in a cohort of screened individuals; among them, the first major gene deletion in the CFI locus was described. Heterozygous mutations in the THBD gene were recently documented in Italy[47,54]. Cells with anomalous THBD are less efficient at inactivating C3b. THBD mutations account for 3%-5% of patients with aHUS, according to registries from United States and Italy. In addition, mutations related to the genes encoding proteins that activate and potentiate the complement pathway may occur. Such mutations determine a “gain of function”. To date, few heterozygous CFB mutations have been described in patients with aHUS[66,78]. These mutations result in increased stability and activity for C3 convertase due to a “super B factor”. These patients have a continuously activated alternative pathway, with very low C3 levels. These mutations are rare, accounting for 1%-4% of patients with aHUS. In 25% of patients a functional consequences of the mutation has been identified. Only four mutations in factor B have been functionally characterized. All of these mutations are located in the vWF domain of the proteins, where C3 and factor B bind. All mutations are heterozygous and associated with C3 consumption. Therefore there are two functional consequences: (1) A direct gain of function mutation leads to excess binding and affinity between factor B and C3b; and (2) There is also an indirect gain-of-function mutation; indeed there is a reduction in C3b binding to factor H and MCP. Thus, in both cases that yield a super C3 convertase, it is more efficient to cleave the C3 on the cells. Heterozygous C3 mutations have also been described. Such C3 binds weakly to MCP, indirectly causing a gain of function. Consequently, there is an increased binding of CFB to C3b and an increase in C3 convertase. 2%-10% of patients with aHUS have C3 mutation. The defect caused by these mutations is a proteolytic inactivation of C3b, but it is difficult to delete C3 and form iC3b on the cells. 28 mutations in C3 have been identified; most are heterozygous and are associated with induced C3 consumption and low serum C3. Table 3 reports the frequencies of various mutations in complement-factors genes according to registry data. Table 3 Gene mutation rate of different complement factors according r-hemolytic uremic syndrome registries data. Up to 12% of patients with aHUS have two or more mutations in CFH, CFI, MCP, THBD, CFB and C3. In conclusion, one or more abnormalities in the regulatory complement system have been documented in 70% of pediatric or adult patients with aHUS. In contrast to date in 30% of aHUS no abnormality has been found. Mutations in complement-regulating genes can be found in healthy family members: the penetrance of the disease among carriers of mutations in CFH, CFI and MCP is approximately 50%-60%[50,67]. Thus, the genetic aberrations are important but are not sufficient for the development of aHUS. Affected patients may carry multiple mutations, in more than one gene[67,83] or a mutation in combination with the associated CFH or MCP haplotype. Family members who only carry one mutation or no polymorphisms are not affected, but this could be due to incomplete penetrance. Atypical HUS may not occur until adulthood, even in patients with multiple genetic defects. Thus, an environmental factor, acting as a complement trigger, is most likely essential to developing the disease. In patients with a mutation in CFH, CFI or MCP, the clinical symptoms are commonly preceded by flu-like symptoms, gastroenteritis or other infections. In conclusion, atypical HUS requires both environmental factors and genetic abnormalities. In addition to the abnormalities already described, at least two polymorphisms in CFH and MCP modulate the presence and severity of the disease. These observations, along with the finding that approximately 10% of patients with aHUS have mutations in more than one complement gene, indicate that the coincidence of different genetic risk factors is a determining factor in the development of aHUS (multiple hits theory)[84,85]. Indeed, aHUS is a complex disease that normally involves the combination of multiple genetic and environmental risk factors. Commonly, patients will have more than one mutation in the genes encoding complement factors, or a combination of mutations with risk-associated polymorphisms. This explains the incomplete penetrance of aHUS, and the differences in its presentation and progression. Screening for complement-system abnormalities: Determination of serum C3 and C4 levels constitutes the base of complement screening. In almost all cases of aHUS C4 levels are normal. Low C3 levels are commonly observed in patients with mutations in CFH, CFI and MCP. Nevertheless normal C3 levels do not exclude the presence of mutations in complement-regulatory proteins. The first step in a screening is to determine the CFH, CFI and MCP levels using radio-immune-diffusion assay (RIDA) or FACS. FACS analysis of peripheral blood mononuclear cells is useful for detecting MCP mutations. Screening for mutations by determining serum levels or cell-surface expression fails to detect low protein levels in 25%-75% of mutations. Genetic analysis is also required. These level-two investigations provide a genetic assessment of complement genes using direct-fluorescence sequencing and mixed ligation-dependent probe amplification. To rapidly identify the gene involved, genes should be screened based on the frequency of mutation detection (CFH 30%, MCP 10% and CFI 2%-5%). Furthermore, mutations cluster in certain exons (60% of CFH mutations cluster in complement control protein modules 19 and 20; 90% of MCP mutations in control protein modules 1-4; 60% of CFI mutations in the serine protease domain). By screening these regions first, cost and detection time can be minimized. Patients awaiting kidney transplantation constitute an exception. CFI mutations are less common than MCP mutations and, unlike MCP mutations, are associated with relapse after kidney transplantation. Thus, in these patients, one possible alternative is to screen for factor I instead of MCP after CFH to avoid relapse after renal transplantation[65,86]. Additionally, clinical aspects may differ according to complement abnormalities, as described in Table 4. Table 4 Main clinical characteristics of patients with atypical hemolytic uremic syndrome according complement abnormality. MCP 5%-15% 0%-6% 70%-90% < 20% ??? In all patients with clinical manifestations that are typical of aHUS, the serum levels of C3, C4, factor H and factor I should be determined as part of the genetic analysis and as a prognostic tool. Normal C3 serum levels do not exclude the presence of C3 regulatory-protein mutations. After serology, all patients presenting with clinical aspects of aHUS should accordingly be screened for CFH, MCP, CFI, CFB and C3 mutations. Genes should be screened based on the frequency of mutation detections. In all patients with clinical manifestations that are typical of aHUS, MCP expression in leukocytes should be determined by FACS analysis. In all patients with clinical manifestations that are typical of aHUS, anti-factor H auto-antibodies should be measured. Although mutations in CFI are much less common than mutations in MCP, in patients awaiting renal transplantation, one possible alternative is to screen for the gene for factor I after CFH instead of MCP to avoid relapse after transplantation. Due to the incomplete penetrance, relatives of patients with aHUS and a recognized complement abnormality should be screened for the same mutation. TTP is an uncommon thrombotic microangiopathy that is primarily observed in adults, often with central-nervous-system involvement, a high relapse rate and with a mortality rate of 15%-20% also in patients treated by plasma exchange. Due to its potentially similar clinical presentation, a differential diagnosis of HUS D+ and aHUS should be considered. TTP is associated with acquired (or less commonly genetic) ADAMTS13 deficiency. ADAMTS13 is a disintegrin and metalloprotease that cleaves vWF. vWF is central in hemostasis, because it induces platelets aggregation and thrombus formation on the damaged endothelium. 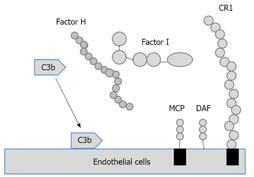 Endothelial cells produce vWF as a large multimer. ADAMTS13 then degrades vWF into progressively smaller circulating products. The deficit is more commonly acquired and caused by anti-ADAMTS13 antibodies. Antibody inhibitors are described in patients treated with ticlopidine. Severe ADAMTS13 deficiency is required to cause TTP and is variably defined as < 5% or < 10% of normal protease activity. ADAMTS13 assays do not provide prognostic information; indeed, prospective studies suggest that severe ADAMTS13 deﬁciency is not found in all patients who may be appropriately diagnosed with TTP-HUS and who may respond to plasma exchange. Inhibitory auto-antibodies identified during the acute episode may be associated with a worse prognosis. Once patients are in remission, severe protease deficiency or the presence of inhibitors is associated with an increased risk of relapse. Congenital TTP occurs due to mutations in ADAMTS13. More than 90 such mutations have been described. Congenital TTP is rare and accounts for 5% of the cases. Moreover, associated mutations in ADAMTS13 and CFH have been described. Several authors discuss HUS caused by a defect in cobalamin metabolism alongside aHUS. A rare form of aHUS complicates an inherited defect of intracellular cobalamin 1 (Cbl) metabolism. Defects in the intracellular metabolism of cobalamin were initially investigated in complementation studies. Cobalamin-C deficiency is attributable to homozygous or compound heterozygous mutations in the gene responsible for methylmalonic aciduria and homocystinuria (MMACHC) on chromosome 1p34. The condition is inherited as an autosomal recessive disorder. Over 40 mutations have been reported, but one mutation, 271dupA, accounts for 40% of all cases which mainly occur in Europe. The clinical presentation of Cbl-C deficiency differs by the age of onset. The most severe is an early presentation in neonates or infants under six-month-old. Mortality is high. Prompt diagnosis is essential, as delayed diagnosis is associated with adverse outcomes. Excess homocystine and methylmalonate in urine is the first diagnostic sign. The Cbl-C defect is confirmed either by complementation studies on fibroblasts, or by genetic investigations of MMACHC mutations. aHUS is clinically similar to other thrombotic microangiopathies. Kidney involvement is common, although neurological or cardiac symptoms are also observed[101,102]. Neurological involvement prevails in TTP, with various manifestations. Atypical HUS prevails in childhood, but several authors have described adult cohorts in genetically predisposed subjects. The triggering events are often an infectious disease or a common gastroenteritis, though rarely enterohemorrhagic diarrhea. The onset is often insidious, and relapse and disease in relatives are common. A correct and prompt differential diagnosis is essential for appropriate treatment. In children, but not in adults, the age of onset, family history, and clinical presentation are useful for a correct differential diagnosis; however it is possible to positively identify the HUS subtype. In neonates and in children younger than 6 mo of age, the most probable diagnosis is aHUS due to congenital complement abnormalities, although SPA-HUS may also occur. Congenital TTP (Upshaw-Schulman syndrome) and methylmalonic aciduria should be considered in the differential diagnosis. In children between 6 mo and five years of age, post-diarrheal STEC-HUS predominates, but complement-related HUS is also possible. In adolescent and preadolescent patients, aHUS due to complement abnormalities prevails, primarily due to MCP abnormality and anti-factor H antibodies. Similarly, TTP due to ADAMTS13 auto antibodies is common at these ages. In adults, diagnosis may be more difficult because adults may also present with secondary atypical HUS and immune TTP, which may be determined or favored by autoimmune diseases. Pregnancy, transplantation and drugs are other common causes of secondary atypical HUS. A useful flow chart for a correct differential diagnosis is suggested by the consensus document recently published by Campistol et al. In patients with thrombocytopenia and microangiopathic hemolysis presenting neurological symptoms and/or renal involvement and/or gastrointestinal involvement, ADAMTS13 activity and Shiga toxin/STEC test should be evaluated first. If the ADAMTS13 activity is less than 5%, TTP is the most likely diagnosis; if the Shiga toxin/STEC test is positive, STEC-HUS is the most likely diagnosis. If the ADAMTS13 activity is higher than 5% and the STEC test is negative, a differential diagnosis must be distinguish between aHUS and secondary HUS. In all patients with HUS symptoms, a Shiga toxin/STEC test should be performed. Anomalous E. coli HUS is a possible diagnosis in patients of unusual age or in whom diarrhea is absent. ADAMTS13 activity should be determined in all patients with aHUS because clinical manifestations and organ involvements in HUS and TTP can overlap. Blood must be collected before plasma infusion or exchange. Plasma ADAMTS13 can now be determined under 24 h by enzyme-linked immuno sorbent assay. Screening for defective cobalamin metabolism is strongly recommended in children with HUS, because mortality from multivisceral failure is high in neonates. A prompt diagnosis and B12 supplementation can favor recovery. Screening for complement factors should be performed in all patients with hemolysis elevated liver enzymes low platelets (HELLP) syndrome or post-partum or post-transplant HUS. Complement mutations have been described in 36% of women with HELLP syndrome, 86% of cases of post-partum HUS and 29% of transplanted patients with de novo post-transplant HUS. The treatments for the various forms of HUS/TTP are described under the same heading because most of treatment approaches are similar for different diseases. Because the prognosis is often severe, prompt supportive treatment may improve the outcome. Electrolytes and water-deficit must be replaced, especially in patients with HUS D+. The recent advancements in intensive care and in dialysis treatment have reduced mortality, mainly in children. For children the best option is peritoneal dialysis. Sometimes, especially in the case of therapy-resistant malignant hypertension, bilateral nephrectomy is life saving and can control the spread of micro vascular lesions when the kidneys are the major site of the disease. Any patient suspected to have HUS should be sent to a specialized nephrology center,or, if necessary, an intensive care unit. Platelet infusions are strongly contra-indicated unless severe hemorrhagic condition is present or a surgical procedure is planned. Platelet infusions may worsen thrombotic microangiopathy (TMA). Central venous vascular access should be placed for dialysis and/or plasma treatment Prophylactic antibiotics should be administered because infections can trigger relapse. In patients with HUS D+, antibiotic therapy is not indicated. In children with SPA-HUS, all blood products should be washed, and plasma infusion should be avoided to prevent administration of additional anti-T-antigen antibodies. To treat HUS D+, using plasma exchange or fresh frozen plasma infusions is still debated. Many use such procedures, but their efficacy has not been supported by randomized trials. Anti-platelets agents can be dangerous because of the high risk of bleeding. Platelet infusions are indicated only if massive bleeding occurs or if a surgical procedure is programmed. Red blood-cell transfusions are necessary when hemoglobin levels decrease and anemia symptoms are present. In the case of SPA-HUS, thorough medical and surgical treatment of the invasive pneumococcal infection is essential. Intensive care is often needed because of the multi-organ involvement. In children with SPA-HUS, all blood products should be washed, and plasma infusion should be avoided to prevent the administration of additional anti-T-antigen antibodies. In aHUS, plasma therapy is the first-line treatment, though such treatment is supported by expert opinion more than by randomized clinical trials[106-108]. Plasma exchange should be performed together with fresh-frozen plasma infusion. Indeed, plasma exchange removes CFH, CFI, CFB and C3 mutated in addition to anti-factor H antibodies, an infusion of frozen fresh plasma normalizes levels of CFH, CFI, CFB and C3. Moreover, plasma exchange associated with plasma infusion avoids the volume overload. Plasma-therapy efficacy differs according to the mutated factor. Indeed, 63% of patients with factor H mutation have a partial or complete remission with plasma therapy. Stable and complete recovery is obtained in 5% of patients, while 37% progress to death or renal failure. Only 25% of patients with factor I mutations reach partial or complete remission with plasma therapy, while 75% progress to death or renal failure. The prognosis of aHUS due to MCP mutation is not influenced by plasma therapy because MCP is not a circulating protein. Plasma-therapy efficacy is poorly documented in patients with C3, CFB or THBD mutations. On the contrary plasma therapy is strongly recommended, mainly in association with immunosuppressant, in the case of aHUS due to anti-factor H antibodies. In clinical practice, because biologic data on complement abnormalities or ADAMTS13 activity are not available in short timeframes, expert clinicians suggest that an empiric plasma therapy should be undertaken as soon as possible after presentation. Plasma therapy should be performed as frequently as possible until a normal platelet count, hemoglobin and LDH have been attained. A lack of improvement with plasma therapy can be ascribed to various causes: HUS due to abnormal cobalamin metabolism or congenital ADAMTS13 deficit or to plasma-therapy resistant complement abnormalities. In such cases, a different treatment should be considered. Plasma therapy in patients with HUS D+ could be useful but has not been supported by randomized trials. All patients suspected to have aHUS should first be treated by plasmapheresis and/or frozen-plasma infusions. This “empiric plasma therapy” should be started as soon as possible, after presentation. Plasma therapy should be performed as frequently as possible, with plasma exchange (PE) at 1.5 plasma volumes per session. When disease activity is controlled by daily PE, the recommended subsequent frequency of PE is five times a week for 2 wk and three times a week for the subsequent 2 wk. The demonstration of MCP mutation allows the withdrawal of plasma therapy. For patients with CFH, CFI, C3 or CFB mutations, the modality and the interval between sessions must be determined individually. In “plasma-resistant” cases different diagnoses should be suspected, or different treatments should be tried. The use of antibiotics, sorbents to bind Shiga toxin and monoclonal antibodies against Shiga toxin are worth consideration in the treatment of HUS D+. Antibiotic treatment in patients with enterohemorrhagic diarrhea or HUS D+ is controversial. In fact, in vitro studies have documented that higher toxin quantities are produced by E. coli exposed to non-lethal antibiotic concentrations. In particular, antibiotic therapy during the diarrheal phase is discouraged, because such treatment does not protect against evolution to HUS[109,110]. To avoid the evolution of enterohemorrhagic diarrhea to HUS, during the diarrheal phase, sorbents to bind and neutralize Shiga toxin have been administered. Research in this field is still ongoing, but to date, the results have been disappointing. Another option for the future is to treat patients during the diarrheal phase with monoclonal antibodies against Shiga toxin. In December 2005, the United States Food and Drug Administration (FDA) approved orphan drug status for 2 chimerical anti-Stx antibodies. These antibodies neutralize circulating Stx1 and Stx2, and thus have the potential to treat the disease and prevent serious complications. The drug is still in the experimental phase and, the European Medicines Evaluation Agency (EMEA) has also designated these antibodies as orphan drugs for the same indication. Immunosuppression is the treatment that is more commonly adopted for acquired TTP. In fact, although 80% of these patients enter remission with plasma therapy, one-third of them have a relapse. Because the vast majority of patients with TTP have an autoimmune disease, immunosuppressive therapy is indicated when the response to plasma therapy is weak or when following relapses. Many authors recommend steroid therapy. Nevertheless, randomized controlled trials with high dose steroid therapy are lacking and a relationship between steroids and ADAMTS13 deficit or the presence of inhibitors has not been documented. Rituximab, a monoclonal anti-CD20 antibody has been prospectively evaluated in adults with unresponsive or relapsing TTP[115,116]. Alternative immunosuppressive therapies to TTP (e.g., vincristine, cyclophosphamide and cyclosporine) are infrequently used, and their efficacy and safety have not been sufficiently documented. Immunosuppressive therapy is also commonly used in patients with aHUS due to factor-H auto-antibodies[117,118]. While renal transplantation can be safely performed in patients with HUS D+, overall, renal transplantation in atypical HUS is associated with approximately 50% of aHUS relapses. The relapse rate differs according to the genetic abnormality. Patients with factor-H or factor I mutations have poor transplant outcomes, with graft loss within two years of transplantation. In contrast, patients with MCP mutations usually have favorable outcomes. In these patients, the missing protein is present on the cells of the transplanted kidney. Nevertheless, relapses are also described in patients with MCP mutations. These relapses may be ascribed either to endothelial microchimerism or to associated mutations of factor H or factor I[120,121]. There are few reports of renal-transplant outcomes in patients with C3 or C3B mutations; however, according to these reports, the relapse incidence appears to be high[66,122]. In addition, a high incidence of HUS recurrence has been described in patients with anti-factor H antibodies; such patients may benefit from treatment with plasma therapy and rituximab if the treatment is initiated immediately before transplantation[118,123]. Renal transplantation from a living related donor is strongly contra-indicated. The risk of a familiar genetic mutation is high, independently from the genetic screening. The results of such screening are often biased by: the inadequacy of the screening and the incomplete penetrance of several mutations. In addition to the risk of relapse in the recipient, the development of aHUS in asymptomatic donors has been reported . Several studies have suggested that calcineurin inhibitors, which have endothelial toxicity, should be avoided; however, mTOR inhibitors may also be toxic to the endothelium, through the down-regulation of vascular endothelial growth factor (VEGF)[125,126]. aHUS may recur after renal transplantation; several studies suggest that plasma therapy at the time of recurrence often fails to rescue kidney function and prevent graft loss[117,120]. Therefore preventive plasma therapy is recommended. Several observations confirm the benefits of preventive plasma therapy started before surgery and maintained intensively during the first months after transplantation. Renal transplantation is recommended for patients with HUS D+. Renal transplantation is not recommended in patients with factor H or factor I mutations. Patients with MCP mutations, without associated mutations in factor H, factor I, factor B, C3 and without anti-factor H antibodies have a low risk of relapse after transplantation. Patients with factor-B or C3 mutations have a high risk of relapse, though this finding if based on scarce reports. Patients with anti-factor H antibodies should be treated before transplantation to reduce antibody titers. Renal transplant from living related donors is strongly discouraged. Calcineurin based immunosuppression is still considered the best, in the absence of new immunosuppressant agents. Preventive plasma therapy is recommended to avoid aHUS recurrences after transplantation. Factor H and factor I are produced by the liver; therefore, combined liver-kidney transplantation appears the best option for patients with mutations in CFH or CFI. The initial outcomes in patients with CFH mutations were disappointing. Nevertheless, favorable outcomes have recently been reported in patients treated with intensive plasma therapy before and during surgery[129,130]. Combined liver-kidney transplantation should be undertaken in patients with aHUS due to CFH or CFI mutation. Plasma therapy before and during surgery may improve outcomes. Because there are few reports in the literature, all transplantations in patients with aHUS should be recorded in international registries. Eculizumab is a recombinant, humanized, monoclonal anti-C5 antibody and is a new drug, recently registered by the FDA and the EMEA for the treatment of aHUS. Eculizumab binds specifically to the complement protein C5, halting the complement cascade and inhibiting production of cell-killing protein complexes. Eculizumab, licensed initially for the treatment of paroxysmal nocturnal hemoglobinuria, was recently licensed for the treatment of atypical HUS. All relevant prospective controlled studies have documented the efficacy of eculizumab in the treatment of aHUS. More recently, eculizumab efficacy was also documented in aHUS recurrence after renal transplantation. Overall, these data suggest that long-term eculizumab treatment is highly effective for the prevention and treatment of post-transplant aHUS recurrence and indicate that anti-C5 therapy should be started promptly after a recurrence. As mentioned above, a complement hyper-activation has recently been suggested to be at the basis of all types of HUS, D+HUS, atypical HUS and TTP. A proof of this concept is provided by the efficacy of eculizumab in treating non atypical HUS. After the report of three children with severe STEC-HUS who fully recovered after receiving eculizumab, eculizumab was used during the STEC-HUS outbreak in Germany in 2011. Many of these patients benefitted from treatment, although these data are challenged by the good outcomes obtained from plasma therapy. Whether eculizumab may be a useful adjunct to treating the most severe forms of STEC-HUS must be clarified by definitive reports from the German epidemic and by prospective, randomized, controlled trials. In addition, eculizumab has been used randomly with good results in the treatment of patients with severe TTP and ADAMTS13 deficiency due to high titers of anti-ADAMTS13 antibodies. These patients had not previously responded to treatment with plasma therapy and immunosuppressant. Eculizumab blocks terminal complement activation; therefore, patients may have increased susceptibility to infections, especially with encapsulated bacteria. All patients must be vaccinated against Neisseria meningitides, at least one week before treatment. Maintenance antibiotic prophylaxis is highly recommended because not all serotypes are covered by vaccination. In pediatric patients, vaccination against Haemophilus influenzae and pneumococci is also necessary. It is not still clear how long the eculizumab treatment should be extended. This issue is also relevant because of the high cost of treatment. According to the drug data sheet, the treatment should be chronic. Relapses have been described after drug discontinuation, but some patients can safely withdraw from the drug without relapses. It is currently impossible to predict the most appropriate duration of treatment and which “low-risk” patients will safely discontinue the treatment. Eculizumab is the drug of choice for the treatment of aHUS. Its usefulness in D+HUS and TTP should be clarified by prospective, randomized trials. The success of eculizumab treatment is related to its use immediately after aHUS diagnosis. In pediatric patients in whom plasma therapy could be technically difficult, early eculizumab use is recommended before aHUS diagnosis. Eculizumab is the treatment of choice for aHUS recurrence after transplantation. Severe thrombotic microangiopathy has been observed upon the discontinuation of eculizumab, and monitoring should continue for at least 12 wk after discontinuation. Patients must be vaccinated against Neisseria meningitides before being treated with eculizumab. Antibiotic prophylaxis is recommended during eculizumab treatment. Several complement inhibitors are in phase-I or phase-II trials. Several of these drugs attack C5, but, in contrast to eculizumab, they are small molecules that are less immunogenic and have a potential for oral absorption. Some new compounds have C3 as a target. Such compounds could be more effective, but they may also be less safe, having the potential to cause more infections and autoimmune disease. A further possibility is the replacement of endogenous complement regulators with plasma-purified or recombinant CFH. HUS of unknown etiology occurs often in the course of a systemic disease, a physiopathologic condition or after the assumption of drugs. With the development of our knowledge, in many patients, systemic diseases or drugs appear to be the triggering factor in genetically predisposed subjects. Moreover, a recent study found either mutations or CFH polymorphisms in the majority of patients with secondary aHUS. The main clinical conditions that either cause or represent the triggering factor for aHUS are: (1) Infections, with particular reference to human immunodeficiency virus (HIV); (2) Calcineurin inhibitors and transplantation; (3) Pregnancy; (4) Autoimmune diseases; (5) Malignancy, cancer chemotherapy and ionizing radiation; (6) Glomerular disorders; and (7) Drug assumptions. HUS is more prevalent in the HIV-positive population and is associated with high mortality. The pathogenesis of HIV-HUS is poorly understood. It is assumed that the virus directly affects the endothelium, thus causing TMA. Another infection that has recently been recognized as a possible cause of aHUS is H1N1 influenza. H1N1 could cause HUS, either favoring bacterial pathogens such as Streptococcus pneumoniae or acting as a trigger in subjects with complement abnormalities. One study documented a high incidence of urinary tract infections in TTP patients. This study suggests molecular mimicry between antibodies to infectious agents and ADMATS13 and suggests the need to identify and treat bacterial infections, which could serve as an antigenic stimulus in patients with TTP. Other important causes of infectious TMA, mainly in post-transplant patients, are viruses as cytomegalovirus (CMV) and parvovirus B19. CMV infection has been described as a cause of HUS after transplantation of different organs[140,141].CMV infection and the use of antithymocyte globulin are significant predisposing factors for the development of HUS after bone-marrow transplantation. Parvovirus B19 is most commonly associated with aplastic anemia refractory to erythropoietin. In some cases, thrombotic microangiopathy associated with collapsing glomerulopathies has preceded allograft vasculitis in renal transplantation[142-144]. HUS occurs after liver, kidney, heart and bone marrow transplantation. Both de novo HUS and recurrent HUS are observed after renal transplantation. In most patients, the causative role of HUS is the use of calcineurin inhibitors that are thought to precipitate aHUS by direct endothelial cell injury. mTOR inhibitors are often used to avoid this complication, but these drugs may also cause aHUS via VEGF inhibition. In the case of hematopoietic cells transplantation, aHUS seems to be related to the conditioning regimen (irradiation) or to infections developing after transplantation. As mentioned above other relevant causes of HUS in the post-transplant setting are infectious diseases. Pregnancy-associated TMA accounts for 8%-18% of all causes of TMA. Pregnancy associated TMA may be related to ADAMTS13 deficiency, complement dysregulation or unknown mechanisms. ADAMTS13-deficiency-related TMA occurs mainly during the second and third trimester of pregnancy. This finding may results from the progressive decrease in ADAMTS13 and the parallel increase in vWF antigen during normal pregnancy. The levels reach their lowest point during the second and third trimesters, which may potentiate the inhibitory effect of anti-ADAMTS13 auto antibodies, thus leading to TMA. HELLP syndrome is another disease that occurs more often in the same pregnancy period. HELLP syndrome is considered a TMA-like disorder based on several similarities between HELLP and HUS/TTP. Interestingly, some forms of HELLP syndrome share a common genetic risk factor of complement dysregulation with aHUS. The question of whether HELLP syndrome is a TMA is relevant because if the link between HELLP syndrome and complement dysregulation is confirmed, complement inhibition may represent a treatment for severe HELLP syndrome. Pregnancy-associated TMA may also occur in the post-partum period. It is associated with alternative C3 convertase dysregulation. In a recent review of 21 cases of pregnancy-related aHUS from the French aHUS registry, 80% of patients had abnormal complement dysregulation. HUS may be a clinical manifestation of lupus erythematosus, scleroderma and anti-phospholipids syndrome. HUS/TTP has been reported in 8.4% of Systemic Lupus Erythematosus (SLE) patients. The etiology is unclear. Antibodies to ADAMTS13 and the platelet glycoprotein CD36 have been described in patients with SLE and may cause endothelial injury and trigger the release of ultra-large vWF multimers, culminating in TMA. Several reports have noted the relationship between TMA and the presence of antiphospholipid antibodies. HUS and, less commonly, TTP and HELLP syndrome, may be the presenting manifestation. The existence of TMA in association with APS forces to rule out the catastrophic variant of the syndrome. Patients with previously diagnosed APS may also develop TMA later during the course of the disease. Disseminated carcinoma has been associated with HUS. In a registry in the United States, 89% of the 85 patients had adenocarcinoma (mainly gastric). In some patients, HUS developed before the beginning of antineoplastic therapy, but almost all patients received mitomycin during chemotherapy. HUS in disseminated carcinoma may be related either to chemotherapy or to ionizing radiation. Infectious diseases occurring during malignancy may also have a role. In a small number of cases HUS develops superimposed on glomerular disease. HUS and membrano-proliferative glomerulonephritis may coincide. Both diseases are associated with alternative-pathway complement activation and in several patients, mutations affecting factor H have been identified. More than 50 drugs and other substances have been associated with the development of TTP/HUS, but many case reports are difficult to interpret because there is uncertainty regarding the diagnosis of TTP/HUS and the relationship of drug exposure to the onset of TTP/HUS. Moreover, it is difficult to understand whether aHUS is drug-induced or a consequence of the condition for which the drug was administered. The drug may also be a trigger in predisposed subjects. Drugs may cause aHUS via two main mechanisms: immune-mediated damage and direct toxicity. Quinine, which is used in the treatment of malaria and leg cramps, causes immune-mediated aHUS. HUS induced by quinine-dependent auto-antibodies has been reported in adult patients, usually elderly women. Symptoms occur as soon as 12 h after the ingestion of quinine by a sensitized patient. Calcineurin inhibitors may induce aHUS by direct toxicity to the endothelium, mediated by endothelin-1. mTOR inhibitors may induce aHUS by the inhibition of VEGF. Among the drugs used to treat malignancy, cisplatin and mitomycin are known to cause aHUS. Mitomycin C is thought to cause aHUS by a direct toxic effect on the endothelium. In patients receiving mitomycin as part of combination chemotherapy, the incidence of aHUS is 4%-15%. The use of anti-platelet agents, the thienopyridine derivates clopidogrel and ticlopidine, is associated with drug-induced TTP. Laboratory studies indicate that most cases involve an antibody to ADAMTS13 metalloprotease; few cases are caused by direct endothelial damage. Knowledge of HUS is developing exceptionally rapidly, most likely due to several factors. HUS is a rare disease, and not enough attention has been paid to rare diseases in the past. In part because of the difficulty of collecting and studying cohorts of adequate size. Second because the treatment of rare diseases often relies on progress in related fields such as epidemiology, immunology and genetics. Indeed, while the typical diarrhea-associated HUS was described in 1955, substantial progression has been made in our knowledge of atypical HUS over the last decade. As mentioned above atypical HUS is primarily related to mutations in the genes encoding regulatory proteins of the complement cascade. Over the last decade, substantial advancements have been made in this field. Outstanding researchers in this field recognize that the work is far from being completed. Indeed, every year new aspects are identified, including many mutations (primarily type II); many aspects of gene penetrance and genetic polymorphisms remain unknown. The role of antibodies in TTP has been clarified, as well as the role of antibodies anti factor H. The possible role of antibodies against other complement proteins is still unknown, and their role in secondary HUS or TTP has been identified but not yet clarified. Randomized controlled trials are the basis of evidence-based medicine. Such trials are extremely difficult to be undertaken for a rare disease. Only international cooperation may overcome such difficulties. Fortunately, such cooperation is now in progress and has been repeatedly referenced in this work. Rare diseases imply also orphan drugs, including for HUS. Even if national and international guidelines have been made for essential therapies, such as plasma therapy, only recently has a new drug, eculizumab, been approved both by the FDA and EMEA, though only for atypical HUS. Very recent studies report the use of this drug in other forms of TMA. Indeed, the complement hyper-activation seems to be the basis of all forms of TMA. The role of eculizumab in TMA treatment, the duration of therapy and the management of this drug are most likely related to the randomized trials that require international cooperation to be implemented. New drugs are on the horizon, but their development is hindered by the previously mentioned difficulties. New strains of E. coli and/or other microbes producing Shiga toxin should be carefully studied in typical or enterohemorrhagic HUS. In addition to E. coli O157:H7, several strains have been recognized to be responsible for HUS, including O157:H4 strain that caused the outbreaks in Germany several years ago. Moreover, some therapeutic aspects of HUS D+ should be better clarified in terms of the role of plasma therapy. In fact, plasma therapy is not recommended as first-line therapy in HUS D+; though good results were observed in the German outbreaks, they were not observed in randomized trials. The monoclonal antibodies against Shiga toxin could represent a new therapy for the future, but to our knowledge, they are still orphan drugs and lack final approval. After the report of three children with severe STEC-HUS who recovered fully after receiving eculizumab, eculizumab was used during the STEC-HUS outbreak in Germany in 2011. Many of these patients treated with eculizumab benefitted, even if these data are challenged by the good outcomes obtained by plasma therapy. Whether eculizumab may be a useful adjunct in treating the most severe forms of STEC-HUS must be clarified by the definitive reports from the German epidemic and by prospective, randomized, controlled trials. Genetic studies of TTP must be completed, and new mutations (in addition to the 90 already identified) may be described in the future. The role of the antibodies should also be better clarified, as documented by TTP occurring after drug absorption or pregnancy. Immunosuppressive therapy in the treatment of antibody-mediated TTP is well documented, as in transplantation. The role of eculizumab is still debated but eculizumab may be useful in TTP treatment in patients who are resistant to plasma and immunosuppressive therapy. In atypical HUS, the detection of new complement-related mutations (both type I and type II) in genes encoding regulatory proteins will improve our understanding of the incomplete penetrance of the disease. In addition, the role of the environment and triggering factors will improve our understanding of the occurrence of the disease in adults. The role of genetics in secondary HUS is essential. The primary lesson in this field comes from a French study of 21 pregnancy-related HUS. Complement abnormalities were found in 18 of the 21 patients. In our opinion, a comprehensive complement assay should be conducted in all cases of secondary HUS. Currently, secondary HUS is of unknown etiology. Many such diseases will soon be understood. Finally, this paper makes several diagnostic and clinical recommendations. We present the most current data, but the progressive improvement of our knowledge on HUS and related disorders, will likely change our approach to these diseases. We will thus modify these recommendations as necessary.